1. Wash the snakegourd and scrape the outer skin with the knife. 2. Cut lengthwise and remove the seeds. Then cut the snakegourd into small pieces as shown. 4. In a kadai / wok, add the oil, and when it is hot, add the mustard seeds, urud dal, curry leaves, red chillies and onion one by one as mentioned. 5. Cook till onion are half cooked. 6. Add in the snake gourd and channa dal and mix well. 7. You can sprinkle some water while cooking to for the snake gourd to get cooked. Take care not to add more. 8. When they are done, add in the grated/shredded coconut and mix well. 9. Cook for another 2 to 3 min and switch off the stove. 10. 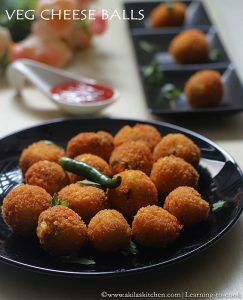 Serve it as a side dish for rasam sadam or sambar sadam as I do. nice poriyal. we make something similar too. Looks so perfect totally delicious. Yep, have to agree on the nutrients of gourd and the simplicity but uplifting with exciting flavors. Definitely with rice but sometimes my other half does enjoy such dishes with bread. Can have this poriyal with some hot piping rasam rice,love it very much. 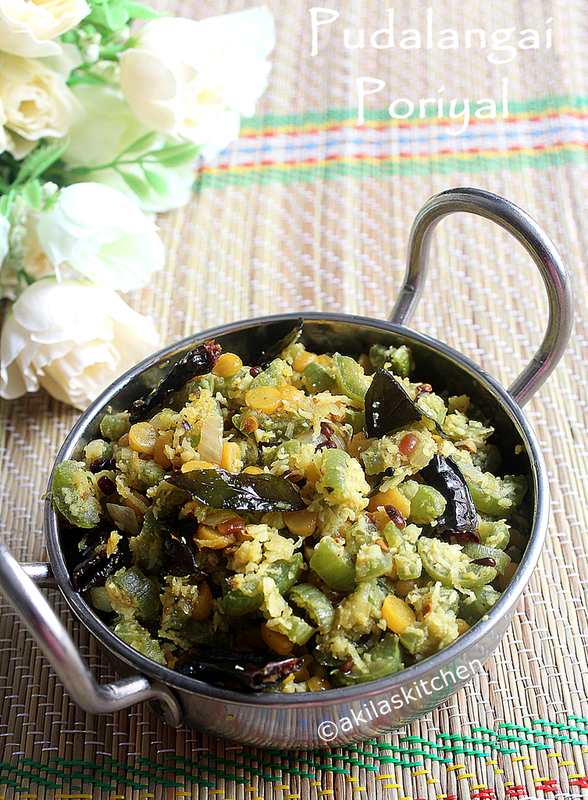 Poriyal looks so delicious and comforting. Must have tasted awesome as well. Goes well with kaara kuzhambu ! Yummy ! i like this veggie in kootu.. nice presentation..
looks very nice n lovely clicks!! 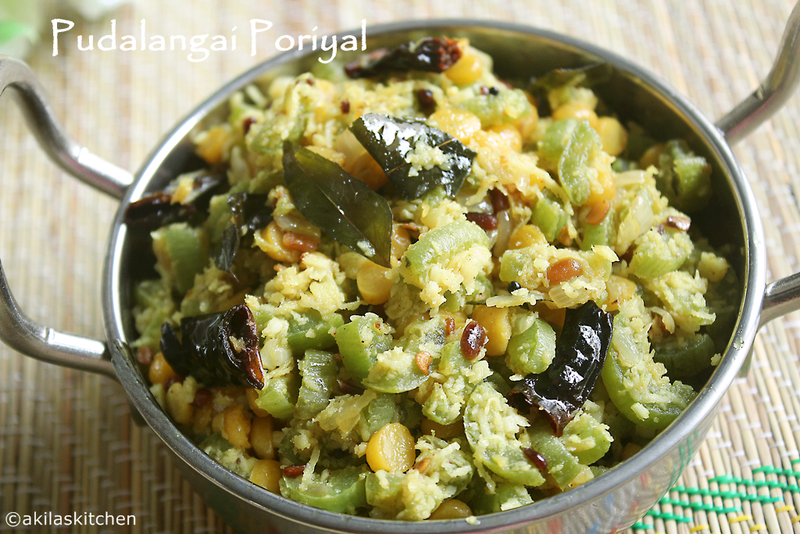 I prepare this poriyal very frequently. Looks yummy! my mom makes the same way,quite a tasty kootu. I love this poriyal.. we don't get this vegetable here.. I love pudalangai. The kootu and poriyal both taste delicious. 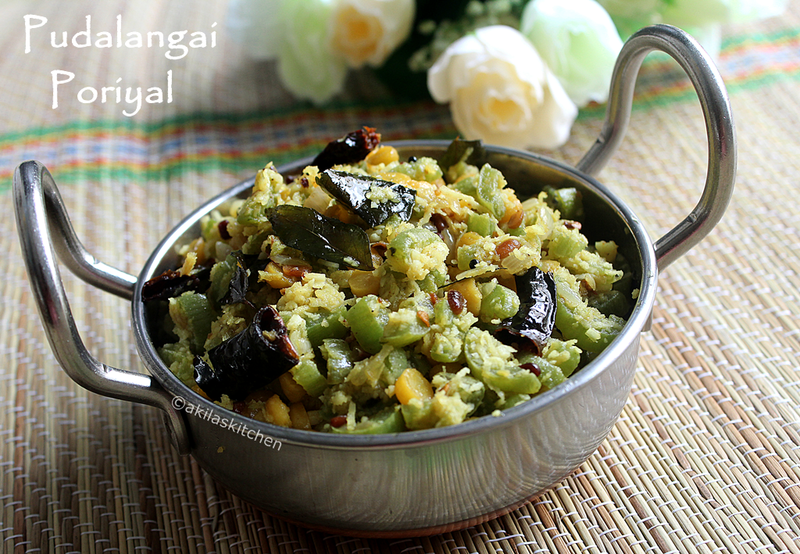 pudalanga poriyal is my favorite too,healthy side dish. Nice clicks. . Healthy poriyal..